Jeffrey Stephenson surrounded by several of his computer designs. He is a fan of the Mid-Century Modern designs depicted in the AMC television series "Mad Men"
By day, Jeffrey Stephenson works as an information technology professional, but in his free time, he's better known as "slipperyskip." That's his Twitter handle and the name he uses on computer hardware forums where he posts about how he transforms retro furniture and antique appliances -- he once turned an Elvis microphone into a fully functioning PC. His handcrafted designs have made him a celebrity in many computer hardware circles and a living legend among PC modders. "Sometimes an idea hits me that I just can't shake," he said. "It starts to dominate my every thought until the only way to get rid of it is to act on it. The Shure 55 microphone is an example. The idea of using it in a computer design ran in the back of my head for nearly a year. One day it all clicked and I just started building what became the Unidyne PC." He believes that most people like their technology to look like technology. But that's not his audience. "I speak to those who like to express their style in everything they come in contact with," he said. 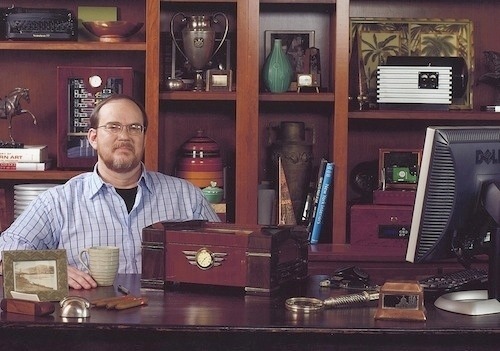 Stephenson built his first homemade PC when he was a teenager. 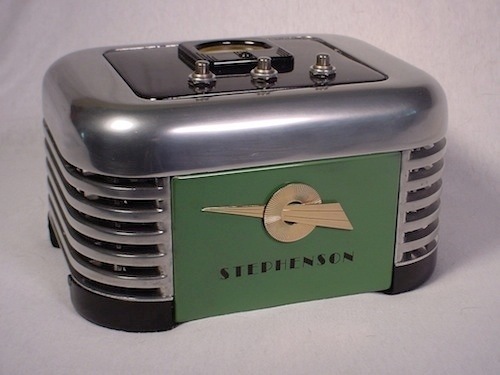 "It was a Digicomp mechanical 3-bit computer, an educational toy designed to teach about binary numbers," said Stephenson. Since then he's created 30 unique computers, each a masterpiece blending modern technology and design styles ranging from Art Deco to Mission to Mid-Century Modern. He has never sold any of them, but he did enter his Decomatic living room entertainment PC in the 2007 Intel PC Design Challenge. One of his biggest joys is when his wife uses his creations to decorate their Live Oak, Florida area home. "My wife says the Mid Century Madness and G-metric Nano are a couple of her 'techno-integration' favorites," said Stephenson. Unlike computer chips produced by huge teams and fleets of robots in a fab, Stephenson works alone using little more than a Dremel rotary tool and a cordless drill. "I do most of my work from my burgundy leatherLaz-E-Boy recliner," he said. "On a nice day I'll work at a table on my deck." He designs and builds two to three new pieces a year. Each new project relies on equipment donated by companies such as VIA, which provided mini-ITX motherboards, and Microsoft, which shared a pre-beta version of Windows 8 to run on Stephenson's most recent design. "Projects can take from 100 to 300 hours to finish," he said. Stephenson bought one of the first mini-ITX form factor motherboards by VIA Technologies in 2003. He liked the idea of having a small, high performing computer. He had trouble finding a case that wasn't expensive or boring. "Then I stumbled across a site that sold wooden desktop cigar humidors, which had perfect dimensions and a stylish exterior," he said. At the time, Tim Handley, CPU platforms marketing manager at VIA Technologies, was looking for designers who could build PCs in interesting cases that would show how Mini-ITX boards were suitable for small form factor PCs. "Jeffery approached us with an idea to build a PC in a cigar humidor," said Handley in an interview for this story. "We were so impressed with the workmanship and attention to detail that we invited him to our CES event, where his humidor PC got a lot of media coverage." The wireless router-equipped Humidor CL Server ended up on CBS-TV and in Popular Science magazine. Handley began donating components and even inviting Stephenson to attend industry events. "Many of the comments from top management professionals about how good a humidor PC would look on their desk made us consider new product categories and market segments for our Mini-ITX products, which were initially targeted for industrial PCs more than office PCs," said Handley. For many computer hardware geeks, he is considered the godfather of Mini-ITX modding, according to Sascha Pallenberg, a long-time computer hardware reviewer and founder of Netbooknew.com. "Jeffrey is a true inspiration for the global modding and design community," said Pallenberg. "He is such a humble guy, but his designs have been the best for the last decade, and it seems that he will never run out of ideas." "Art Deco is in my DNA," said Stephenson, who lived in San Francisco in the '60s and New York in the '70s. "It inspires me and I want to be surrounded by it." Occasionally he experiments with other styles beyond Art Deco. He once transformed a 1936 antique toaster into DECOmputer, a machine age PC. Another time, after seeing a 1964 Danish desk on eBay, he took to building Mid-Century Modern. Design site Core 77 dubbed it "Don Draper's PC," referring to the lead character of the AMC TV series "Mad Men," which prominently features Mid-Century Modern design. His compact design called Level Eleven uses a solid-state drive, which is compact and quiet as it has no moving parts. "The improved energy efficiency of each new CPU generation helps me to pack more and more computer power into smaller and smaller packages," he said. "This also allows me to concentrate more on a design's style instead of hiding massive air ducts involved in moving quantities of air." Stephenson says he has learned to call a project complete and walk away from it, although at times he's had to cannibalize equipment from an old design to finish a new project. "I still have every computer I have ever built," he said. "I have every component ever given to me by equipment sponsors." Handley, now at GIGABYTE Technology, says that Stephenson has made a significant impact on the computer industry. "He showed the world that a PC can be a statement about oneself in the same way that a haircut or fashion accessory can be," said Handley. "His designs showed the world that with low-power components you are free to explore more design options than with standard desktop PC parts." Here is a slideshow of his creations.